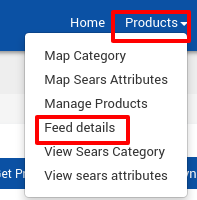 After uploading the product on Sears or after updating the product inventory or the product price, the store owner can check the status of the product feed and sync the selected feeds or all the feeds from the Manage Feed Details page. To view the product feed status on this page, the admin has to update the feed status. Select the check-boxes associated with the required feeds. Click the Arrow button next to the select bulk action list. Click Update Feed Status, and then click the Submit button. Scroll down to the required feed row. In the Action column of the respective row, click the View icon. The store owner can view the following information in the respective columns. Feed Status: The status of the products feed appears. Items Received: Total Number of products that have been uploaded to Sears. Items Succeeded: Number of products that have been successfully uploaded to Sears. Items Failed: Number of products that have a few errors and need to be uploaded again after fixing the error. Item Processing: Number of products that are under product upload processing. Also, the error details and the success details appear on this page.